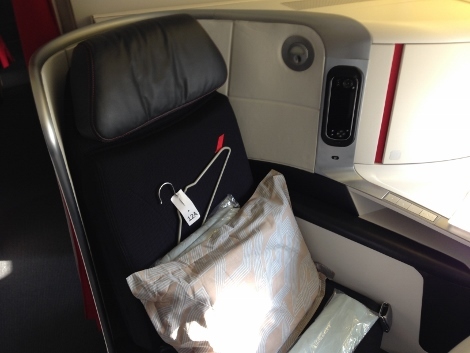 This was one of the first flights of the new business class cabin being retrofitted across the Air France long-haul fleet of B777 aircraft, both B777-200ER and B777-300ER (see news, February 4). The new seat is being fitted across 44 of the B777 fleet, in both three-class — economy, premium economy and business — and four-class, with the addition of the new first class (see news, May 7). In two years, when the seat has rolled out across the 44 aircraft in the B777 fleet, it will be installed on Air France’s A380 and A330 fleet, but not the A340-300s, which will be retired. 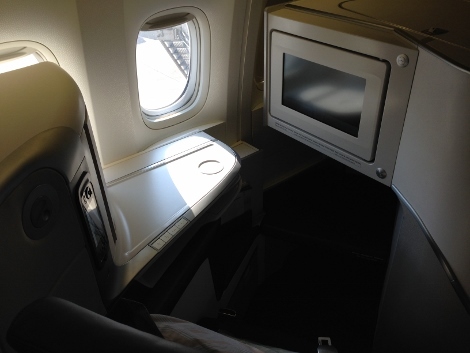 Note that for the next two years, until the B777 retrofit is completed, Air France will be flying with four different types of business class in long-haul, only one of which is fully flat, the seat reviewed here. When the B777 fleet is completed, there will be three types, although this new bed will be on about 40 per cent of the long-haul fleet (2,102 seats). I asked Alexandre de Juniac, the CEO of Air France/KLM, why it had taken so long to get a fully-flat bed on board. He gave two reasons. Firstly, because it is very expensive (€550 million to retrofit the 44 aircraft), and secondly because they wanted to get it right so it was the best in class. Both good reasons, but with the roll-out of this seat it will be the summer of 2017 before this refit is finished. I had arrived on a connecting flight from London Heathrow. To read that flight review, click here. This was flight AF0008 to New York, departing from Gate K41. As there was plenty of time to kill, I went to the Air France business class lounge where the upper mezzanine level had been reserved for press. We then had interviews with Air France management and those responsible for the new seats (not just business, but also economy and premium economy). As a result of these interviews, boarding was delayed and I walked onto the aircraft at about 1900. There was a welcoming committee. Once on board, I hung my jacket on the waiting hanger with its label and then accepted a drink (some kind of juice smoothie with banana in it). 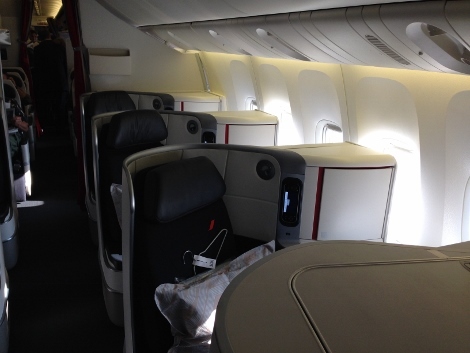 This was a B777-200ER aircraft in three classes seating a total of 280 passengers. 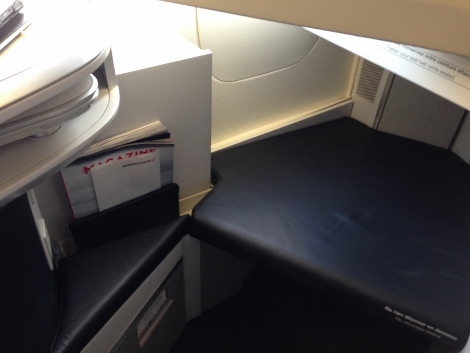 There are two business class cabins in a 1-2-1 configuration of A-EF-L. Rows 1-7 are in the front cabin, and rows 10-12 in the second. 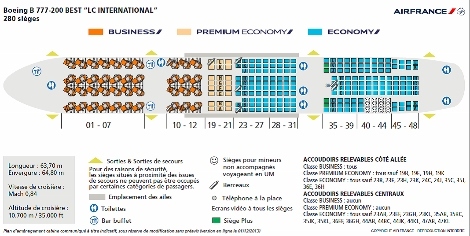 Interestingly, this second cabin is removable — Air France intends to convert this into premium economy during the summer months when demand for business class is lower, then put the business class seating back at the end of the summer. It claims this will be done in an overnight period, taking the aircraft out of service for only a short time. We’ll see. I should also point out that there are only two washrooms for the two cabins. The front cabin has one large washroom in the centre, and the other is on the starboard side. Yes, it’s true it is the same basic Zodiac Aerospace seat as that being flown by Cathay Pacific and American Airlines, but as with those airlines, Air France has sought to customise the seat with designer Mark Collins of Design Investment and design/branding agency Brandimage. It’s immediately obvious where some of the attention has gone. 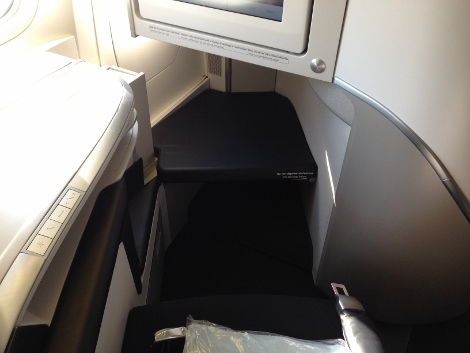 To start with the footrest, this is much larger than on AA and Cathay. In fact, it almost looks like a mistake since your first thought is why would all that room be necessary. But, of course, when sleeping, it makes a big difference being able to assume different positions. Here, you can sense the thought that has gone into the design, since an alcove space contains a bottle of water (already waiting at the seat) but also allows room for your knees if you are lying on that side. Turn over, and you have space towards the aisle. 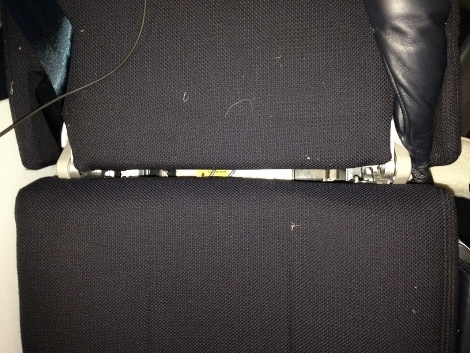 The arm of the seat on the aisle-side goes up and down (it has to be lowered for take-off). When I slept I kept it up and didn’t come close to feeling cramped in the space available. All of this space also means it’s a great seat for a long day flight, since there is plenty of room to spread out and work. 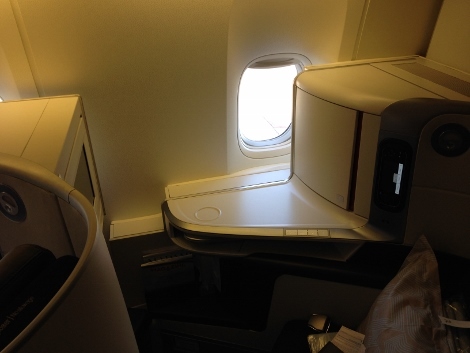 The IFE screen is large at 16-inches and pivots out from the body of the seat in front. As well as being touchscreen, and easily reached when the seat is in an upright position, there is a large touchscreen handset allowing you to watch one thing on the screen itself while having a different view on the handset. Both of those screens are controlled using the handset, which is bigger than many — larger than that on Qatar Airways, for instance — but seems easy to use and quick in response. I had no problems with the Panasonic IFE throughout the flight, which is saying something because I often do. Entertainment is available in 12 languages (French, English, Spanish, Brazilian Portuguese, Chinese, Japanese, Korean, German, Italian, Dutch, Russian and Arabic). While the inflight power did not work to first, when I mentioned this to the flight attendant it started working immediately (maybe a coincidence). The power point takes international plugs so no need for adaptors, although you need to pack these because, although the Air France lounge has an admirable array of power points by every seat, they are all Continental and so don’t take UK or US plugs. The table is ingeniously designed, sliding out from a larger side table (large enough for storing a laptop on when the food comes and you need somewhere to put it). It folds out and is big enough to work on and still have room to place a drink. Also, you can lift yourself out of the seat and into the aisle without having to lift the meal tray, meaning there’s a real sense of freedom and space. 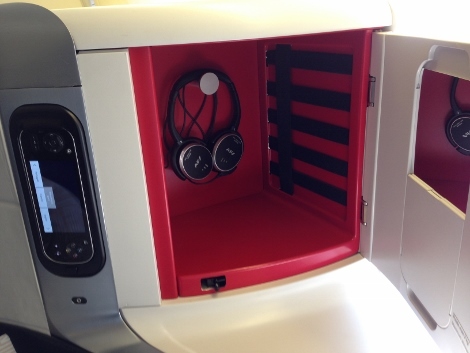 The headphones are in a large locker to one side which you can be used for extra storage. It has some straps along one side for securing smaller objects, although I might be worried about leaving something in there. In addition, there is a small storage area for magazines. The overhead lockers are large, but are set back from the aisle for the centre seats. I noticed one lady have to climb onto the seat to reach the handle as there are no foot steps in the side of the seat, such as I have seen in other models. On the seat were a wrapped-up duvet and pillow, while the seat itself is in a dark upholstery with blue leather for the soft headrest and the arms of the chair. It’s elegant, but it shows any threads from the duvet or napkins which make it soon seem dirtier than it is (see the photos later). 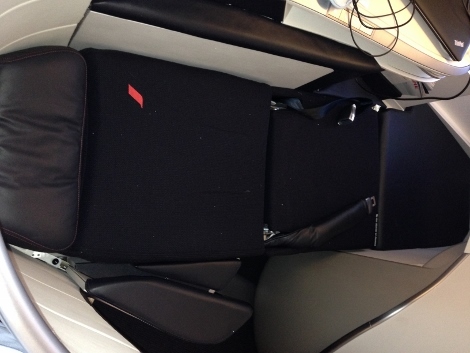 You can watch an Air France video of the seat here. Also on the seat was a bag containing flight socks, slippers and a pair of covers for the noise-cancelling headphones with the instruction to slip them over the ear pieces before use. Obviously, this is for hygiene, but it was a little late by then because I’d already used them. I walked around the cabin and didn’t see a single person with these fitted, so I imagine most passengers would discover this feature only when it was too late. This bag came with a shoe bag folded inside, good for storing your shoes during the flight, and I put these under the ottoman seat in front. 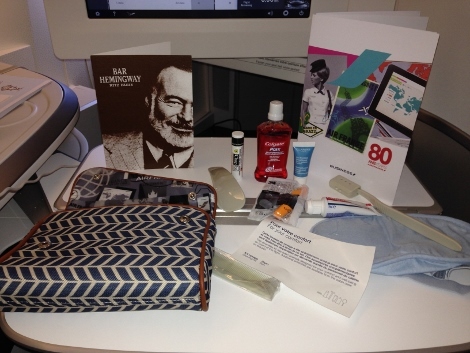 Shortly after take-off, we also received the new amenity bag. This, apparently, is styled after the Air France Concorde bag and certainly is very stylish. Inside were ear plugs, toothbrush, toothpaste, mouthwash, comb, lip balm and shoe horn. I don’t think there’s a bad seat, but I’d avoid rows 1 and 7 in the front cabin because of proximity to the galleys, and also row 7 has only one window. The window seats are all good, although row 12 has a slightly obscured view because of the engines. And the window seats in row 11 are fine, but the overhead locker is partly taken with some trays so is slightly restricted for space. We had a long taxi before take-off, but it gave me time to play with the IFE. There are no cameras allowing for views from the outside of the aircraft, so instead I found appropriate music for testing the capability of the headphones and took off listening to Michael Jackson’s Billie Jean. 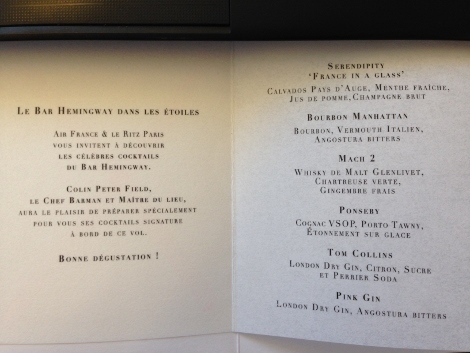 This flight was a little different because we had the Air France/KLM CEO on board, as well as the head bar tender from The Ritz Paris, Colin Field, who encouraged us to try the cocktails he was preparing. I was tempted, but had a lot of work to do, so asked if he could prepare a mocktail of some sort so I wouldn’t make even more mistakes while writing this report. If not, I understood, and would have a Perrier. 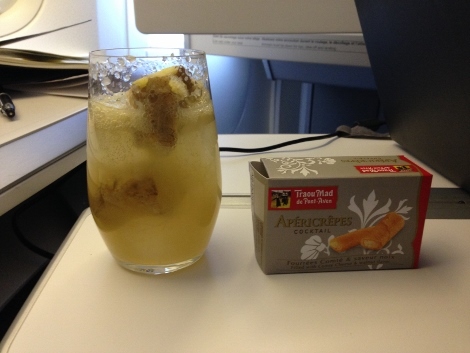 In fact, the mocktail was very nice, with great lumps of ginger in it, refreshing and well-presented with some cocktail snacks. Quite a lot about the food and drink now follows. We try and focus on this for reviews of day flights, and with this being Air France and the promise of emphasising the “unique DNA of the brand” (mentioned many times in chats with management), it seems worthwhile to spend some time on it. 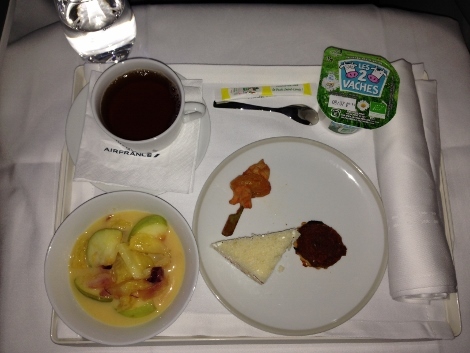 Specific meals can be pre-ordered before boarding (click here for details), while it is also possible to select an express meal of appetiser, cheese and dessert — a good idea. I went for the special meal prepared from the menu of Regis Marcon, holder of three Michelin stars and winner of the 1995 Bocuse d’Or, whose “goal is to, quite simply, ‘lay nature on your plate’, with cuisine featuring mushrooms, green Puy lentils and meats from the Plateau area”. 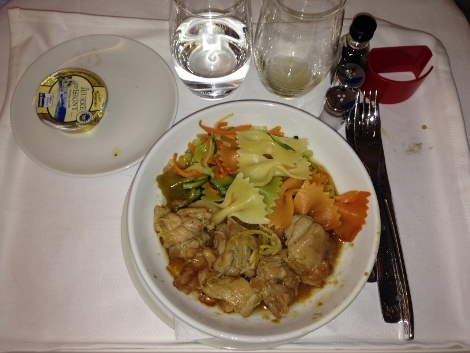 On this flight, his dish was Steamed chicken with honey and soy sauce. 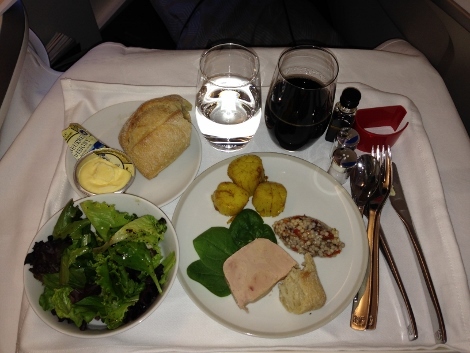 After a description like that, almost any airline food will struggle to satisfy, but it was delicious and had a subtle flavour to it. 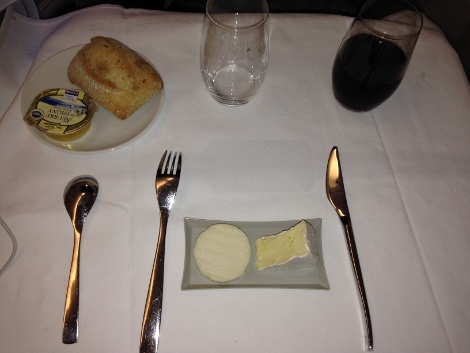 I then had the cheese, which was fine but served with more of the same bread and could have done with some kind of accompaniment. After a dessert of crème brulee ice cream, I was ready to get some sleep. I should point out that service was from the front of the main business cabin, which meant that even after the table had been laid, there was a considerable wait for the food to arrive (at least 20 minutes). 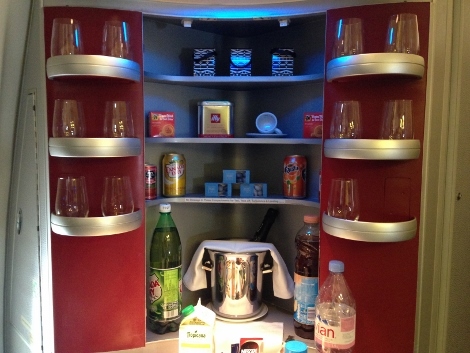 In addition, if all of this isn’t enough, there’s also a nibbles kitchen set up, very attractively, in the galley. It would be good to have an under blanket of some sort on this bed. Not all airlines offer it in business class, but I think it makes a difference, not least because it feels a little more hygienic if you are lying straight on the same cushion as hundreds of other passengers. I didn’t recline the arm of the seat, leaving it up to give me protection from the aisle. But there is so much room I wasn’t bothered by any footfall coming through the cabin. For those who like to watch something before they fall asleep, note that with the seat fullyreclined it’s difficult to watch the entertainment. The IFE screen is fixed at one end (the pivot end) and so if your head goes a long way below the screen, the image on it is not good. When you bring the seat back up, the padded seatbelt gets caught under it, although you’ll only notice this when you try and put it back on. After my sleep I was served the next meal. 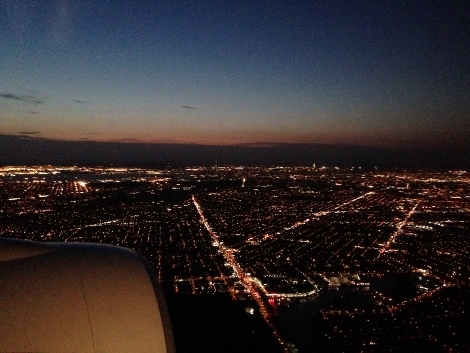 We had left in the early evening and arrived at JFK on time. Very good, a thoughtful adaptation of the Cirrus seat, and with everything you could want for a long-haul flight in business — a fully-flat and comfortable bed, direct aisle access for all seats, lots of room to work and sleep, in-seat power and a good and modern IFE system. 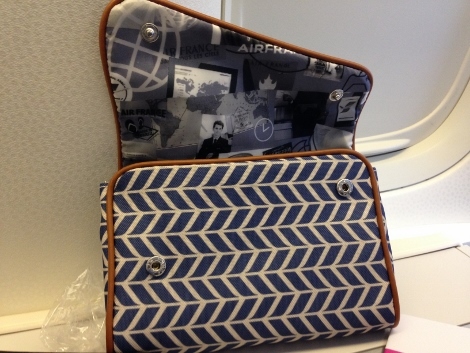 Air France regulars will be waiting impatiently for this product to appear on their flight.